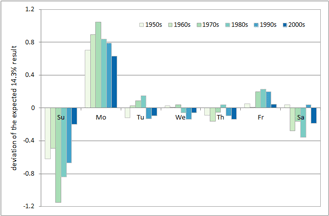 For the EGU 2012 poster I’ve created a diagram with the number of reports for each day of the year. It wasn't a big surprise that most of our collected observations are from springtime with smaller amplitude from autumn. 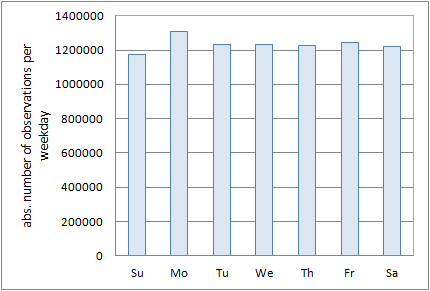 I thought it would also be interesting to look at a statistic about the weekdays of the observations. 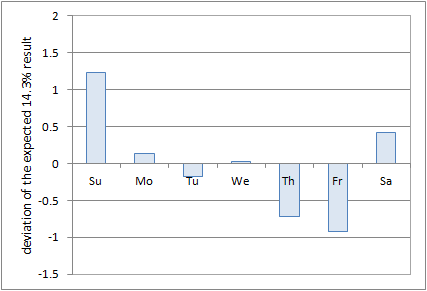 If we think about ideal observations we can assume that phenological phases are equally distributed over all days of the week. 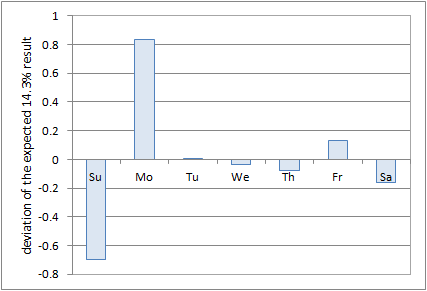 So 14.3% (100% / 7 days) of observations will be on Sundays, 14.3% on Mondays and so on. 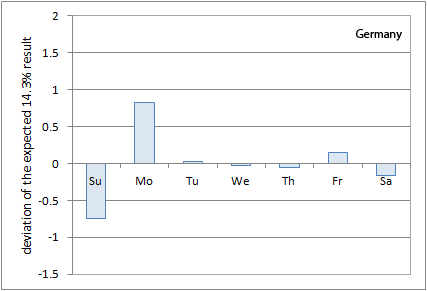 Observers with a 5 day week will probably only report during their shift; volunteer observers (citizen scientists) maybe more on weekends. 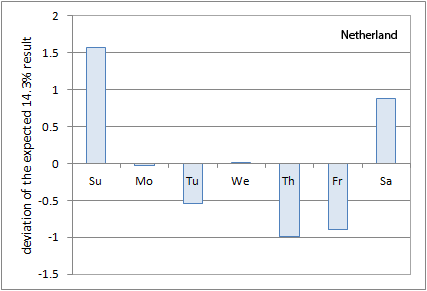 The informative value Figure 2 is not very good,so I have calculated the relative percentage of each weekday and compared it to the ideal result of 14.3% (all observations are equally distributed over the week). 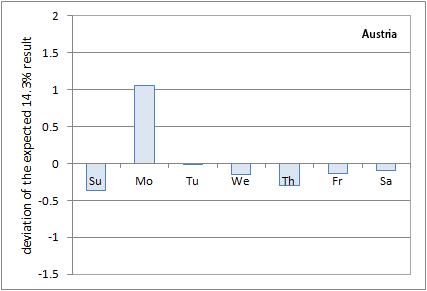 Figure 3: Deviation of observation dates from the ideal result of 14.3%. 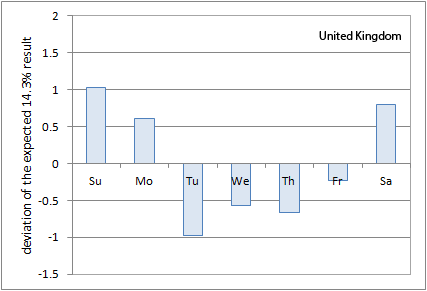 It seems that on Monday late reports are not unusual and on Friday expected phenological events of the weekend will be reported prematurely. Figure 3 shows the mean reporting practice over the whole PEP725 data set - now let's take a look if there are differences between single countries. For this analysis I’ve selected the members with the most stations: the United Kingdom (UK), Germany (DE), Austria (AT), the Netherlands (NL) and Switzerland (CH). That brings us to one last question – the observation practice over time. The previous results were somehow expected, but it might be interesting if there is some kind of trend how we observe our nature. The PEP725 database reaches back to the year 1868, but there are only a few records available. From the year 1950 onwards we observe a fast development of phenological networks all over Europe with the peak in the 1980s. For that reason we will examine the early records all together and the later ones – those starting in the 1950s and onward. Figure 6: Observation pattern in the years before 1950. For the period from 1868 until 1949 we can use about 14,000 observations. As we can see in Figure 6 the monitoring is very similar to the modern citizen scientist’s network as we have found in the Netherland’s records. It seems that volunteer observers are not an invention of recent years. Figure 7: Observations from 1950 until now. Again we look at the deviation from the expected 14.3% result. 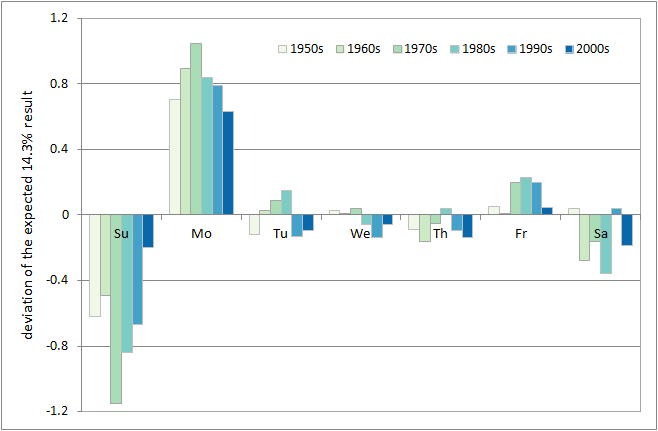 In the 1970s we have reached the peak of weekend observations with a tendency to a more uniform practice nowadays. The occurrence of phenological phases strongly depend on local weather patterns, micro climate and adaption strategies of plants so it is very difficult to identify errors in the cloud of possible variation. 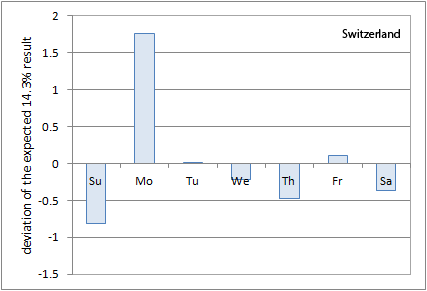 The presented analysis of the relative number of observations per weekday shouldn’t be understood as a tool for quality control, but rather as a means for getting a feeling about different observer types and their behavior. If you have a large number of observations it is very interesting to see the influence of professionals and citizen scientists today and in the past.